My 21st birthday was some time ago. More years than I’d really like to admit, if I’m being honest. While there are many things I remember about this specific birthday, one was an appetizer we had at dinner. The dish was simple enough, consisting of goat cheese baked in marinara sauce and served with toasted baguette. Our server suggested mixing the cheese and sauce together – which we did – and I don’t think any of us could stop eating it. It was slightly tangy and luscious. At the time when I whipped the sauce up for dinner, I wasn’t really thinking about recreating the appetizer in any way. I was just simply getting a bit creative with random items in the fridge and pantry. Now I think of this sauce as a nod to that appetizer…even though I’m making it about a million years later. I’ve included a recipe for the dish I made that night and a separate recipe for just the Goat Cheese and Basil Tomato sauce. If shrimp, mushrooms, leeks, and spinach aren’t your thing, the GCBT Sauce would go great with grilled chicken or be fine all on its own. *Clean leeks by placing them in a large pot of water and swishing them around to release any dirt trapped between their layers. Use a slotted spoon to scoop leeks out of bowl once they are clean. 2 – Grate garlic and onion or mince very finely. Add to medium sauce pot with 1-2 tbl EVOO and sauté on medium-low for 3-5 minutes. Add tomato sauce and season with salt and pepper. Cover and simmer on low for 15 minutes, covered. Stir occasionally. 3 – Meanwhile in a large sauté pan on medium, heat 2tbl butter and 1 tbl of EVOO. Add leeks and mushrooms and sauté for 7-8 minutes or until leeks have softened and mushrooms have browned. Next add shrimp and sauté 4-5 minutes, turning over halfway through. 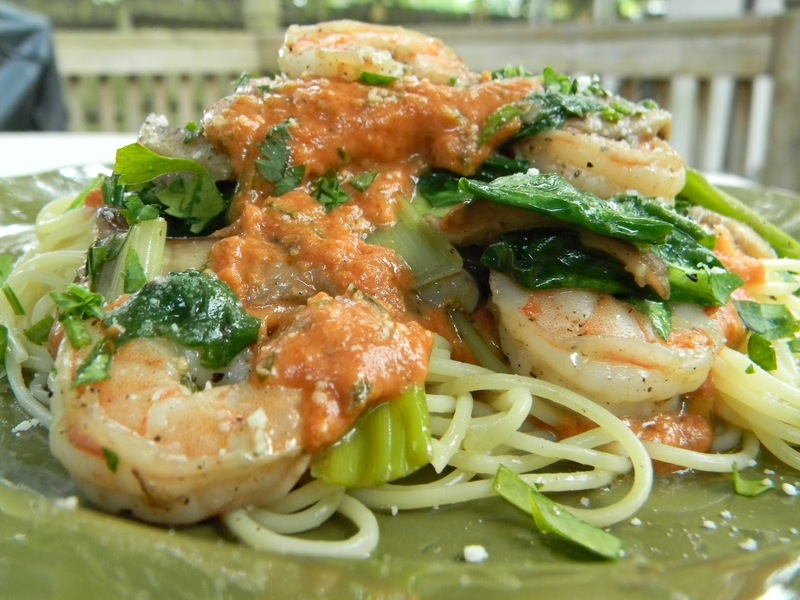 Once shrimp are almost fully pink, add spinach and toss until spinach is wilted. Turn off heat while finishing sauce. 4- To the sauce add the goat cheese and basil then stir to incorporate. Add tomato paste to reach desired thickness. Then allow to simmer uncovered, for one to two minutes. 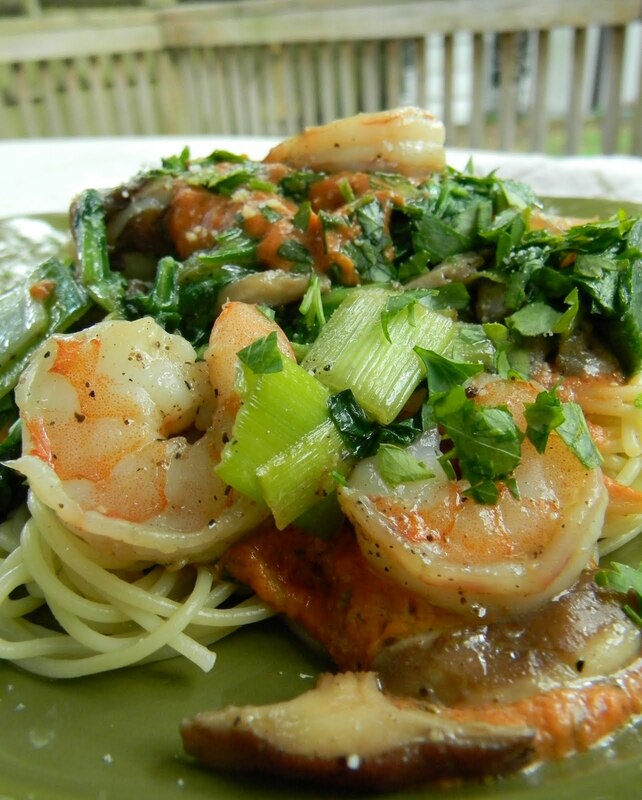 Add to pasta, shrimp and vegetables and toss together to serve. 1 – Grate garlic and onion or mince very finely. Add to medium sauce pot with 1-2 tbl EVOO and sauté on medium-low for 3-5 minutes. Add tomato sauce and season with salt and pepper. Cover and simmer on low for 15 minutes, covered. 2- After 15 minutes, add the goat cheese and basil then stir to incorporate. Add tomato paste to reach desired thickness. Then allow to simmer, uncovered, for one to two minutes. Serve with your favorite pasta.